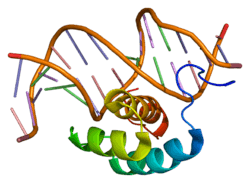 Homeobox protein Hox-B6 is a protein that in humans is encoded by the HOXB6 gene. This gene is a member of the Antp homeobox family and encodes a protein with a homeobox DNA-binding domain. It is included in a cluster of homeobox B genes located on chromosome 17. The encoded protein functions as a sequence-specific transcription factor that is involved in development, including that of lung and skin, and has been localized to both the nucleus and cytoplasm. Altered expression of this gene or a change in the subcellular localization of its protein is associated with some cases of acute myeloid leukemia and colorectal cancer. HOX B6 gene is only expressed in erythoid progenitor cells, which are the precursor to red blood cells used for transport of oxygen and carbon dioxide throughout the body. During development, the formation of the HOX gene factor happens in the first stages of fetal development, namely soon after the establishment of the mesoderm, which is the “middle layer” of the future embryo. However, HOX B6 is only expressed once the undifferentiated stem cells of the embryo distinguish themselves into the erythpoietic phase. The research has shown that HOX B6 is not expressed in hematopoietic stem cells located in the red bone marrow, which are the precursor cells to all types of blood cells, or primordial germ cells (PGCs), the precursor to cells passed on in each generation. Since it is a transcriptional factor, HOX B6 regulates erythpoigenesis (red blood cell formation) using mRNA as the basis for certain protein productions. The specific gene factor for erytopoigenesis has relatively been unobserved in the scientific community, and no known diseases have been associated with a defect HOX B6 gene. However, it has been shown in correlation with major skeletal deformations. 1 2 "Entrez Gene: HOXB6 homeobox B6". ↑ Zimmermann F, Rich IN (Apr 1997). "Mammalian homeobox B6 expression can be correlated with erythropoietin production sites and erythropoiesis during development, but not with hematopoietic or nonhematopoietic stem cell populations". Blood. 89 (8): 2723–35. PMID 9108390. ↑ Rancourt DE, Tsuzuki T, Capecchi MR (Jan 1995). "Genetic interaction between hoxb-5 and hoxb-6 is revealed by nonallelic noncomplementation". Genes & Development. 9 (1): 108–22. doi:10.1101/gad.9.1.108. PMID 7828847. Kaur S, Singh G, Stock JL, Schreiner CM, Kier AB, Yager KL, Mucenski ML, Scott WJ, Potter SS (Dec 1992). "Dominant mutation of the murine Hox-2.2 gene results in developmental abnormalities". The Journal of Experimental Zoology. 264 (3): 323–36. doi:10.1002/jez.1402640311. PMID 1358998. Shen WF, Detmer K, Simonitch-Eason TA, Lawrence HJ, Largman C (Feb 1991). "Alternative splicing of the HOX 2.2 homeobox gene in human hematopoietic cells and murine embryonic and adult tissues". Nucleic Acids Research. 19 (3): 539–45. doi:10.1093/nar/19.3.539. PMC 333645 . PMID 1672751. Shen WF, Largman C, Lowney P, Corral JC, Detmer K, Hauser CA, Simonitch TA, Hack FM, Lawrence HJ (Nov 1989). "Lineage-restricted expression of homeobox-containing genes in human hematopoietic cell lines". Proceedings of the National Academy of Sciences of the United States of America. 86 (21): 8536–40. doi:10.1073/pnas.86.21.8536. PMC 298317 . PMID 2573064. Murphy PD, Ferguson-Smith AC, Miki T, Feinberg AA, Ruddle FH, Kidd KK (Aug 1987). "A moderately frequent RFLP identified by both SacI and BanII with a probe from the HOX2 locus in man (17q11-17q22)". Nucleic Acids Research. 15 (15): 6311. doi:10.1093/nar/15.15.6311. PMC 306101 . PMID 2888083. Levine M, Rubin GM, Tjian R (Oct 1984). "Human DNA sequences homologous to a protein coding region conserved between homeotic genes of Drosophila". Cell. 38 (3): 667–73. doi:10.1016/0092-8674(84)90261-7. PMID 6091895. Chang CP, Shen WF, Rozenfeld S, Lawrence HJ, Largman C, Cleary ML (Mar 1995). "Pbx proteins display hexapeptide-dependent cooperative DNA binding with a subset of Hox proteins". Genes & Development. 9 (6): 663–74. doi:10.1101/gad.9.6.663. PMID 7729685. Castronovo V, Kusaka M, Chariot A, Gielen J, Sobel M (Jan 1994). "Homeobox genes: potential candidates for the transcriptional control of the transformed and invasive phenotype". Biochemical Pharmacology. 47 (1): 137–43. doi:10.1016/0006-2952(94)90447-2. PMID 7906121. Sawcer S, Jones HB, Feakes R, Gray J, Smaldon N, Chataway J, Robertson N, Clayton D, Goodfellow PN, Compston A (Aug 1996). "A genome screen in multiple sclerosis reveals susceptibility loci on chromosome 6p21 and 17q22". Nature Genetics. 13 (4): 464–8. doi:10.1038/ng0896-464. PMID 8696343. Zimmermann F, Rich IN (Apr 1997). "Mammalian homeobox B6 expression can be correlated with erythropoietin production sites and erythropoiesis during development, but not with hematopoietic or nonhematopoietic stem cell populations". Blood. 89 (8): 2723–35. PMID 9108390. Vider BZ, Zimber A, Hirsch D, Estlein D, Chastre E, Prevot S, Gespach C, Yaniv A, Gazit A (Mar 1997). "Human colorectal carcinogenesis is associated with deregulation of homeobox gene expression". Biochemical and Biophysical Research Communications. 232 (3): 742–8. doi:10.1006/bbrc.1997.6364. PMID 9126347. Ohnishi K, Tobita T, Sinjo K, Takeshita A, Ohno R (Nov 1998). "Modulation of homeobox B6 and B9 genes expression in human leukemia cell lines during myelomonocytic differentiation". Leukemia & Lymphoma. 31 (5-6): 599–608. doi:10.3109/10428199809057620. PMID 9922051. Fienberg AA, Nordstedt C, Belting HG, Czernik AJ, Nairn AC, Gandy S, Greengard P, Ruddle FH (Apr 1999). "Phylogenetically conserved CK-II phosphorylation site of the murine homeodomain protein Hoxb-6". The Journal of Experimental Zoology. 285 (1): 76–84. doi:10.1002/(SICI)1097-010X(19990415)285:1<76::AID-JEZ9>3.0.CO;2-K. PMID 10327653. Vider BZ, Zimber A, Chastre E, Gespach C, Halperin M, Mashiah P, Yaniv A, Gazit A (Jun 2000). "Deregulated expression of homeobox-containing genes, HOXB6, B8, C8, C9, and Cdx-1, in human colon cancer cell lines". Biochemical and Biophysical Research Communications. 272 (2): 513–8. doi:10.1006/bbrc.2000.2804. PMID 10833444.